This section describes the Winsock 2 API architecture. 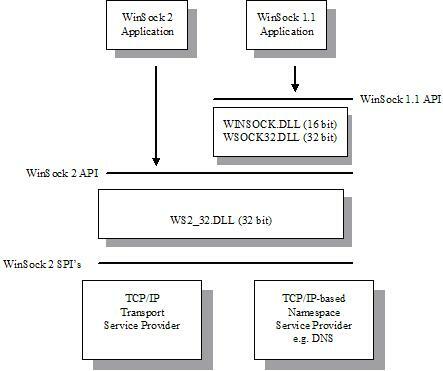 Winsock applications are interfacing with 3 DLLs: WS2_32.DLL, WSOCK32.DLL and WINSOCK.DLL. WS2_32.DLL - Providing Winsock 2 32-bit API and running on top of a collection of Winsock 2 SPIs (Service Provider Interfaces). WSOCK32.DLL - Providing Winsock 1.1 32-bit API and running on top of the Winsock 2 API. WINSOCK.DLL - Providing Winsock 1.1 16-bit API and running on top of the Winsock 2 API.